Almost everyone has heard about the castle in San Simeon built by William Randolph Hearst. 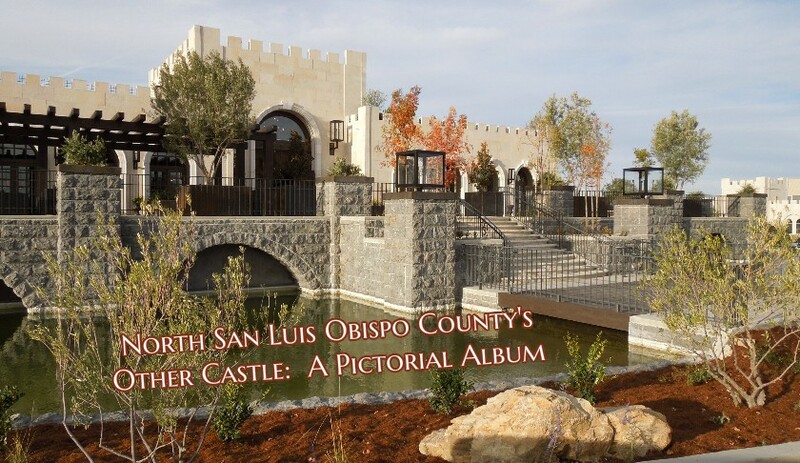 Not as many know about the North County’s other castle built by Gary and Mary Lou Stemper. 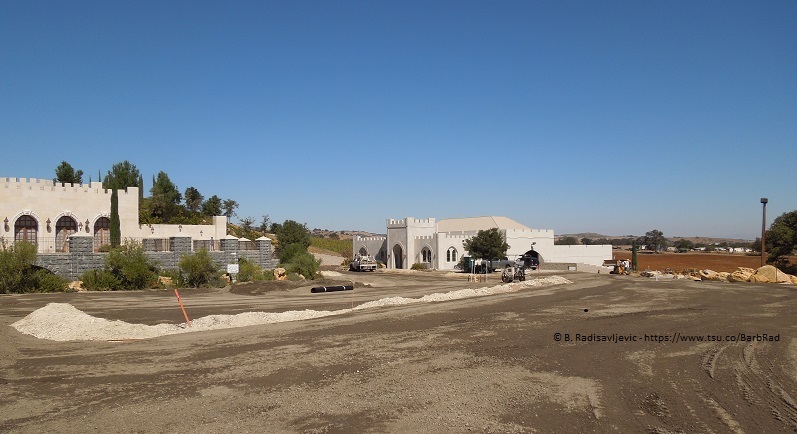 Although not nearly as fancy as the Hearst Castle, it did win the 2007 Structure of the Year Award from the California Concrete Association, and it added a bit of class to my neighborhood on West Highway 46 in Templeton. 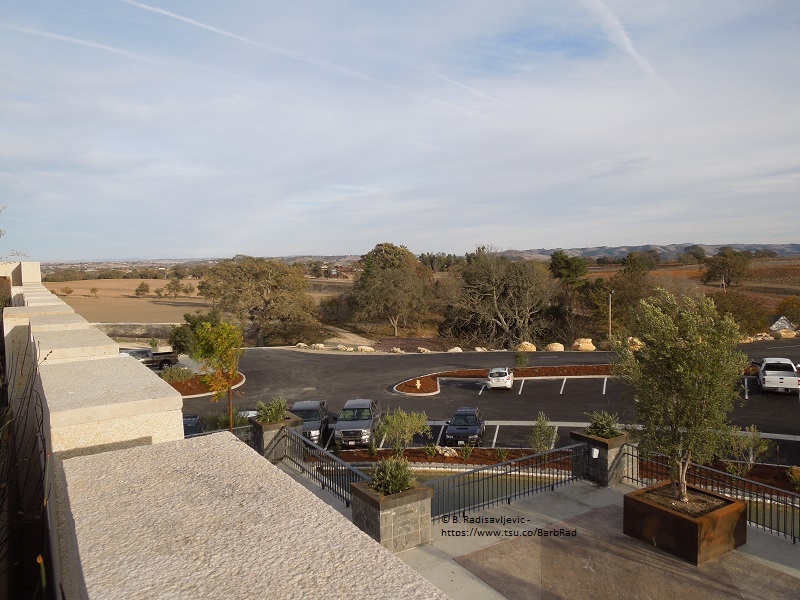 Although technically in Paso Robles, by the time you get as far west as the Castle, which is near the intersection of West Highway 46 and Andserson Road, Templeton and Paso Robles sort of blend together. Eagle Castle Winery was one of my most interesting neighbors. I watched it be built as I drove past it each day. I finally got a chance to visit it on Saturday, August 7, 2010. I crossed the bridge over the moat — a real moat, though it doesn’t go all the way around the back of the castle. The medieval theme was evident throughout the castle except for the music in the tasting room, which was considerably more modern. I guess they didn’t think their visitors would go for the music of the Middle Ages. It was certainly not Heast Castle, but it wasn’t intended to be. 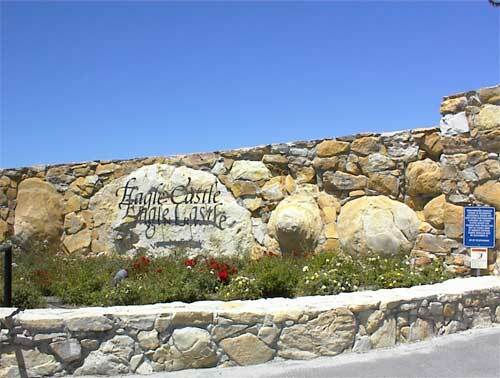 It was Eagle Castle, and it made award winning wines from the grapes in its surrounding vineyards. 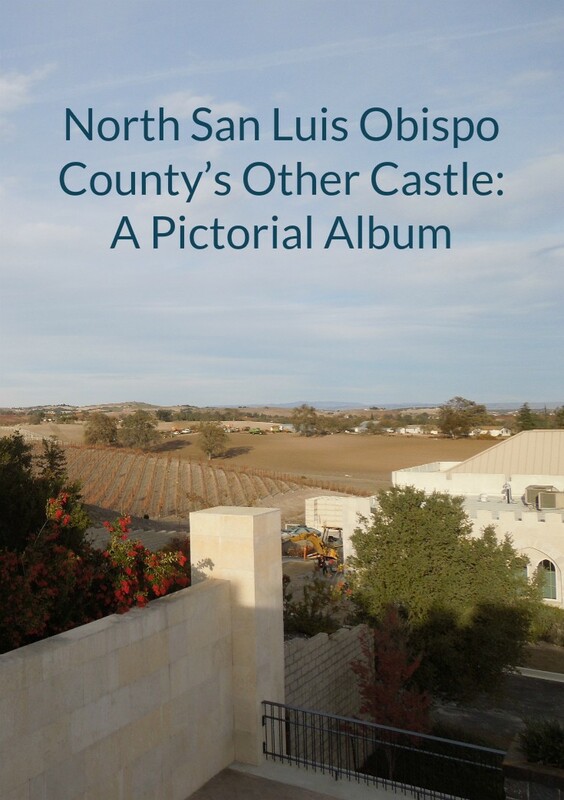 Unlike Hearst Castle, it was free to see and open to the public. It was on the way to Hearst Castle on Highway 46 West. The picture shows the entrance to the driveway to the top of the hill to the castle as it was in 2010. I have visited many of my winery neighbors, and each of them is unique with its own character. Only in wine country could you find a spectacular site such as Eagle Castle right next door to a winery in a small house with a more intimate atmosphere. I spoke with some of the tourists at Eagle Castle who agreed each winery they had visited had its own unique flavor, but most agreed that Eagle Castle was out of the ordinary. 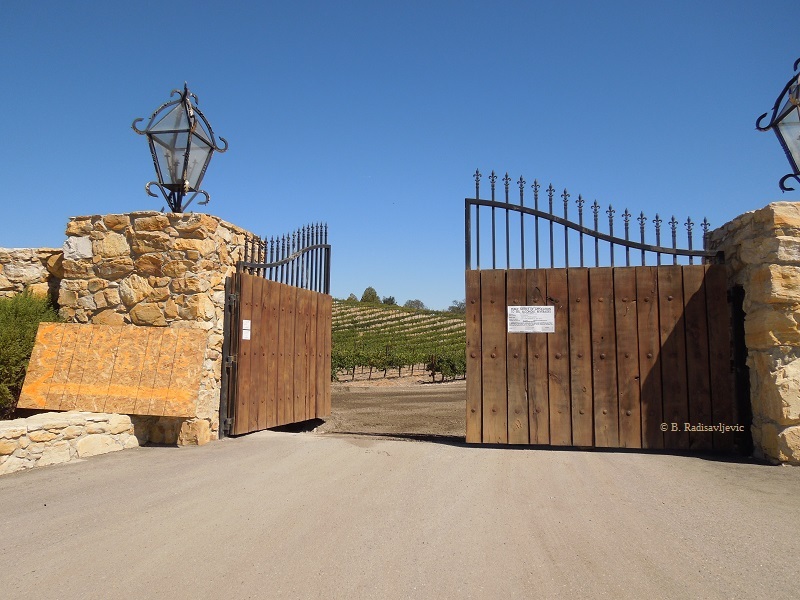 Walk with me through it as it was in 2010 and you’ll see why this was a special attraction in Paso Robles. I am leaving this next part in the present tense as it was written when I published this in 2010 on Squidoo, which like Eagle Castle, has been sold to a new owner. Just consider it an eye witness account of what was. I’ll show you what the castle looks like now a bit later. 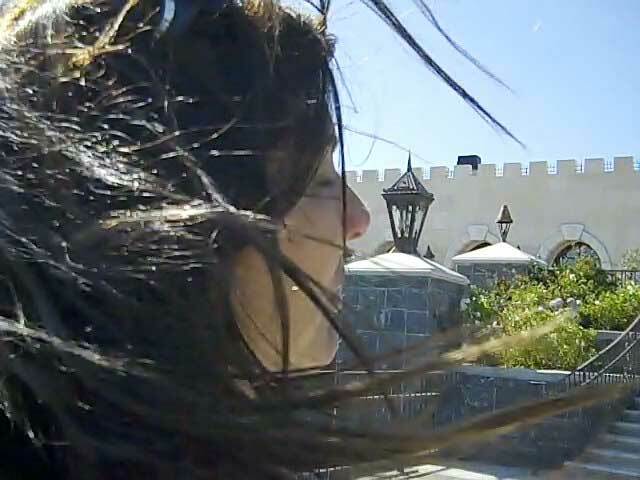 It can be windy at the castle in the afternoons. When you climb the stairs to the castle, you will be on the terrace, which has tables. I’m guessing it’s OK to sit out there and have lunch if you brought it. However you should be aware that in the afternoons it can be quite windy up there, so you might want to plan to be on the patio in late morning or early afternoon.before the ocean breezes arrive. 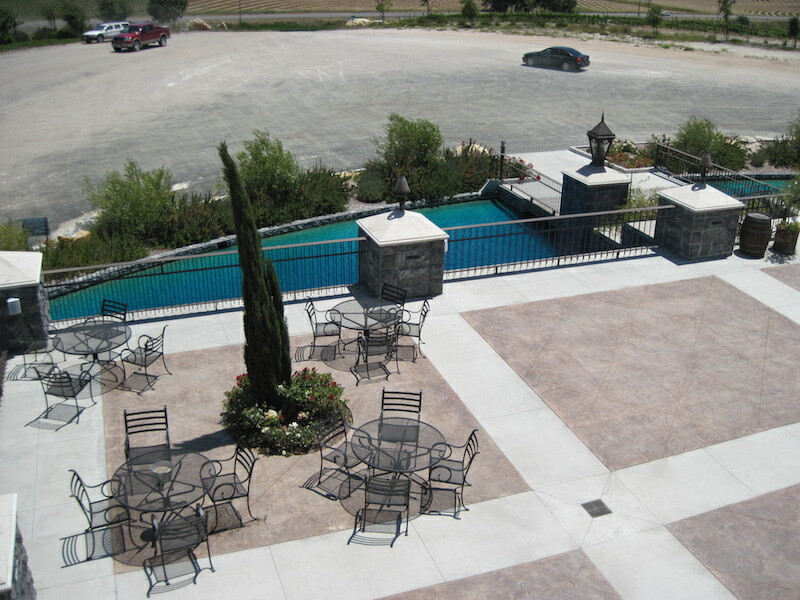 Eagle Castle is one of the two wineries on the stretch of Highway 46 West between 101 and Vineyard Drive with a magnificent view of the surrounding countryside. You will want to bring your camera. You can get great pictures from the parking lot, the terrace, or the upper terrace. 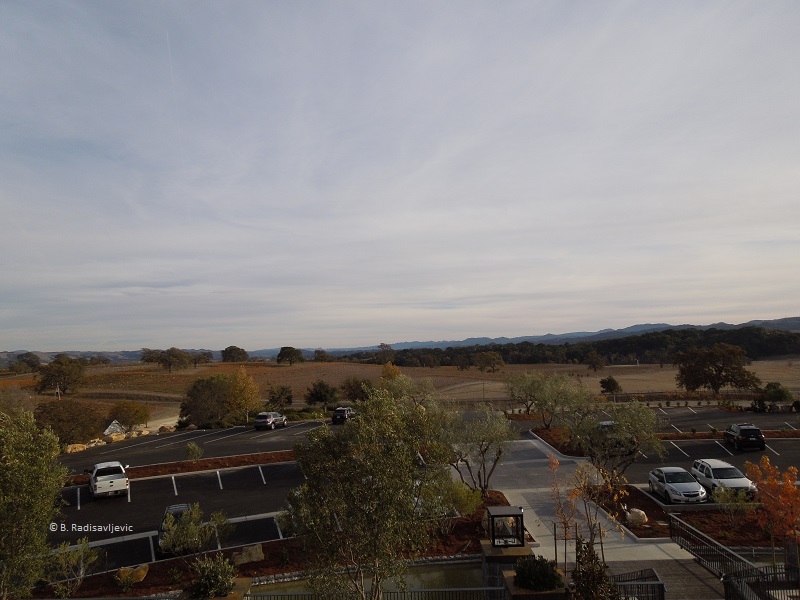 (The other spectacular view is at Croad Winery on Oakdale Road. — my closest neighbor). On a clear day, as most days are during the summer afternoons, you can see for miles around. I was going to start this tour as I climbed the steps to the entrance, but the wind was so loud I couldn’t narrate over it. This is my unique perspective, as one who likes to see the sights more than taste the wines. It’s a shame to live in wine country, surrounded by wineries, and not like wine, but that’s how it is. Wine just doesn’t agree with me, and alcoholism runs in my family, so I made the decision in college to stay away from any beverage containing alcohol. I’m happy with grape juice. I still love to visit the wineries here, though, because they are beautiful — especially the vineyards surrounding them. Some, like Eagle Castle, are worth a visit just for their looks. I noticed that children loved the castle. One little girl I met loved going up and down the spiral staircase. Children will have lots of places to stretch their legs here if this is one stop on a long car trip. And it does have public restrooms and a drinking fountain, so it’s a great place for a pit stop if you need one. It only takes a few minutes to look around while you get the blood circulating in your legs again after sitting for a stretch in the car. This first part of the video tour, covers the downstairs areas and the tasting room. Have You Visited Eagle Castle and Neglected to Take Pictures or Buy a Souvenir? 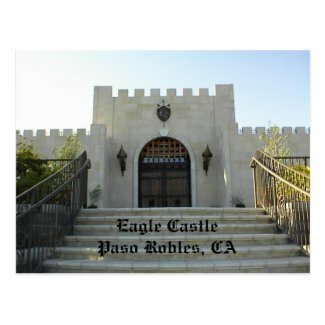 Even though Eagle Castle is no longer what it was, you can still buy a that souvenir you missed or a print of the castle scene you like best by selecting one of these Eagle Castle products from this list at my Zazzle store. Here are some samples. Poster: Suit of Armor at Eagle Castle, Paso Robles : This fellow used to be one of the official castle greeters as you came in the door. 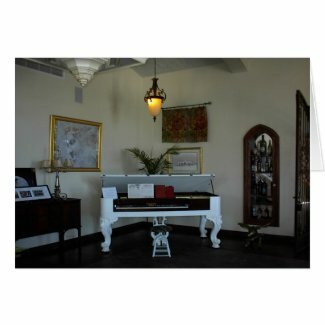 Blank Card: Piano at Eagle Castle: This antique Steinway piano used to be in the tasting room of the castle to the right as you came in. It added a lot of class to it. When the castle was sold, it’s my understanding that this piano was auctioned off for $23,000. If this is not true, I stand to be corrected. My memory isn’t 100% accurate anymore. 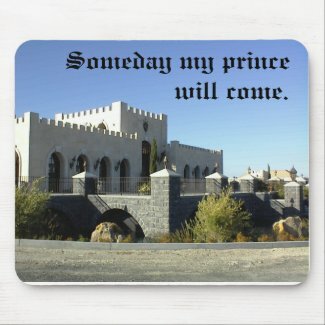 Mousepad: Eagle Castle “Someday my prince will come” I had a bit of fun with this mousepad, envisioning a young lady bound to a computer desk, wishing for something better, something magic, to happen that would transform her life. I included some of the segments where the wind took my voice away with its roar because I wanted you to see the sights even when the narration could not be heard. I normally drove by Eagle Castle at least three times a week in 2013. One day I drove by and the gate was closed. There was a sign on it saying it was closed for an event. The event must of been the bankruptcy of the castle, since it was closed a long time. People had their scheduled weddings cancelled, as I learned from one frustrated bride to be. I kept wondering if the castle would open again and if so, how it would look. Near the end of 2014 I was able to satisfy that curiosity. In September of 2014, I drove by one day and found the gate open again. I knew it had been sold, but I wasn’t sure then to whom or what it would become. I decided to try and find out. First I should probably say I didn’t find what I hoped — a person who seemed to be in charge who could tell me what would happen next at the castle or what would happen to it. It was evident the landscaping of the grounds was being redone. So I’ll just show you some of what I saw as I was trying to take the pictures without being run over by a construction vehicle. Earth was being moved around. 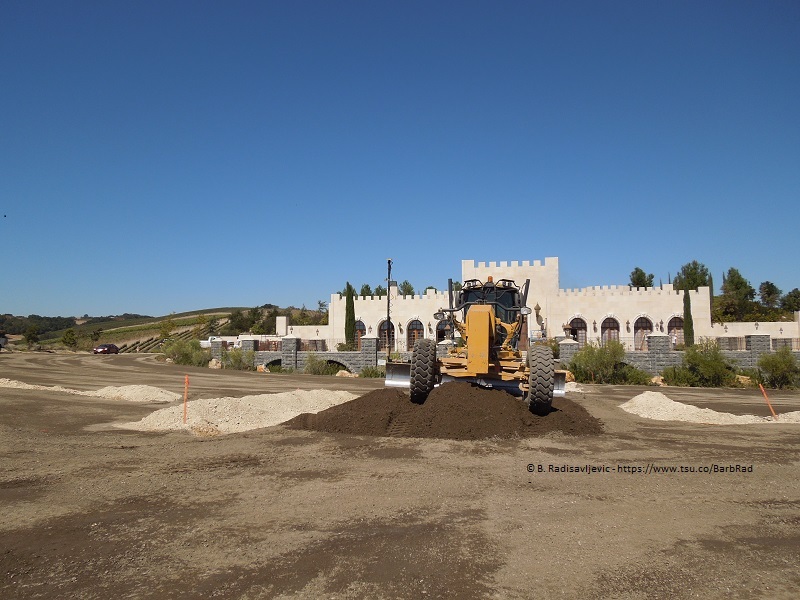 I’d like to show you two more pictures, taken on November 29, 2014, after the castle reopened as Tooth and Nail Winery. These will show you a bit of the renovated parking lot. For comparison, below them, is a photo of the view from the Eagle Castle terrace on June 18, 2011. It was taken from the lower level, whereas the other two were taken from the upper level and show more. I don’t remember the old parking lot as being paved, and it’s hard to tell from my comparison photo. My memory is fallible. That’s why I take pictures. 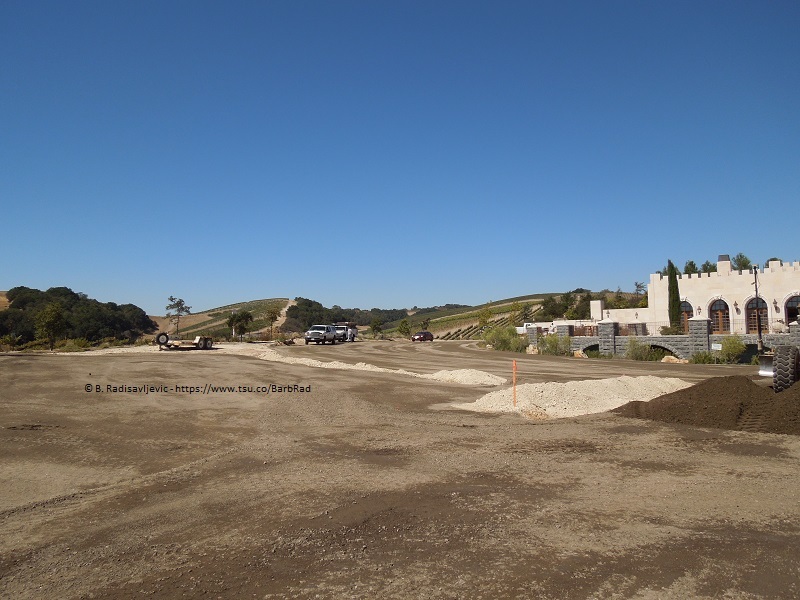 We will look at the new Tooth and Nail Winery and see how the inside has changed in the next post. Meanwhile, I’ll direct you to the blog of someone who did go there to taste the wine and check out what has changed.